A very warm Irish welcome awaits at Cashel Town Bed & Breakfast. 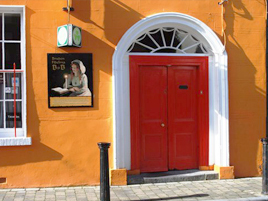 Situated in the centre of town in a quiet side street, a few minutes walk from the Famous Rock Of Cashel. This delightful B&B offers quality accommodation to all. Breakfast is available and our WiFi is high speed and of course Free. Cashel Town B&B is a Georgian town house the perfect base to explore Built in 1808, the house has recently been refurbished to create warm and homely bed and breakfast accommodation in the historic town of Cashel. Cashel Town B&B is the ideal bed and breakfast accommodation to base in for a few days to explore this historic town of Cashel and beautiful part of Tipperary. Many of our bedrooms, all with private bathrooms, have multi channel flat screen TVs, free high speed WIFI, Hairdryer & Tea/Coffee making facilities. Our bedrooms are dressed with crisp linens, cosy duvets and quality towels, ensuring a restful nights sleep. In the morning our freshly cooked breakfast is available from our dining room from 8:00 to 10:00. Breakfast is not included in the room rate. Cashel Town B&B is open all year round except Christmas and offers top quality accommodation, friendly service and exceptional value for money. Just around the corner you will find the Rock of Cashel and Golf course and driving range. The facilities for fishing, tennis, horse riding, windsurfing are all within easy reach. One minutes walk will get you to the main street in Cashel Town where you will find local pubs, restaurants and shops.